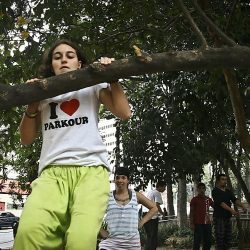 Home InterviewsWomen and Parkour in Gaza. 5 days of training with Parkour Wave. Under the patronage of the Ministry of Culture in Gaza, The Italian Centre for Cultural Exchange (VIK) facilitated a week long festival of exchange with local associations in Gaza. 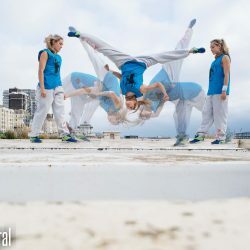 The festival offered five days of workshops in a range of disciplines including parkour, art, graffiti, media , animation, circus and acrobatics. Five Italian parkour practitioners worked for five days with PK Gaza (Khan Younis refugee camp) and 3Run Parkour (Jabalia refugee camp). 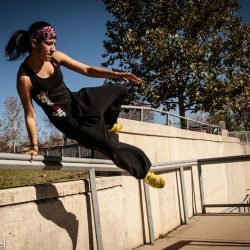 Parkourwave wrote the following report, focusing particularly on the integration of female parkour practitioners and its reception there. 29th December 2014 From the beginning the Arabic media were interested in finding a woman (Betta) with the Italian delegation of parkour practictioners. 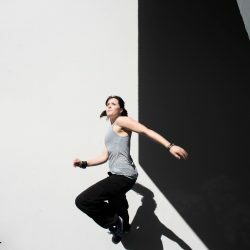 In fact, during the first training session, a local television network and Al Jazeera came to report on not only the Italian cooperation workshop but also on the presence of a woman, the only female parkour practictioner in the Gaza Strip. The female journalist explained to us how unique and important it was to see a woman practice a discipline in Gaza that is thought of as only for men. She was also interested in the fact that men and woman were training together in the same place. The first training session was in the Jabaila gym, facilitated by Muhammad (3run Gaza). The numerous young practictioners were deeply surprised at the sight of a woman training with them. They kept their distance but, despite obvious embarassement, we saw no issues with integration. 30th December 2014 On the second day we trained in the big public square of the Sheik Zaied neighborhood. The situation changed dramatically, and the presence of a woman in the group become very hard to manage. 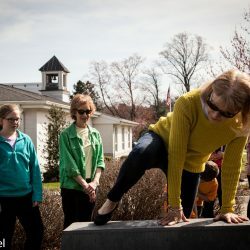 As soon as the practictioners started training, many local adults came uncomfortably close to the traceuse, talking about her and following her. Because of this, a Gaza practitioner firmly asked her to give up training to protect her from disrespectful comments and prying eyes. The men were basically saying that a woman training in a public square with men is allowing their gaze and comments. We felt powerless and frustrated by the cultural gap and the linguistic barrier. 31 December 2014 On the third day we went to Al Aqsa Universitiy, in Khan Younis. We immediately noticed that a public Univestity environment was completely different from the square of an outlying neighborhood. In the University, thanks to the determination of Meri Calvelli (coordinator of the exchange group), we ran a short session with both men and women. A group of 20 women made a circle, following the Italian traceuse near the men’s circle. Then both genders joined for a short running session. After 10 minutes, men and women split up and girls continued training with the Italian traceuse. This episode alone, even if short and isolated, could be seen as the first step of a path. 1 January 2015 On the 4th day of training we perceived an evolution of the relationship between the traceuse and the Gazawi practictioners. From initial disbelief and rudeness, a lot of guys moved towards respect and sharing, despite some confrontations with and admonitions from the most arrogant. Values like group cohesion, sharing and respect that had been transmitted by the coaches to the practictioners also affected the men’s relationship with the female practictioner, who, little by little, became seen as as part of the group. She was now supported and encouraged. While training in the public square of the Khan Younis neighborhood, we felt like the group was more relaxed. Despite our fears, what happened at Sheik Zaied didn’t happen again. The male attendees seemed more respectful and less intrusive, thanks to the practictioners who asked the men to stay further back and to not make comments, but to clap instead. 2nd January On the 5th day we ran a session in the central square in Gaza city. The traceuse decided to rest and assist the coaches. The boys accepted some advice from her, and also let her time some exercises. On day one, this would have been impossible. Bystanders were amused by the scene, but the practictioners continued. 3 January 2015 We looked at the practictioners during the last event on the final day, wondering what we gave them, realizing how much the ideals of parkour could be misinterpretated from who learn from youtube, and realising also how parkour is an excellent metaphor for freedom and the desire to fly… over the wall. Betta: “I’ve been fascinated by the big steps taken in only five days. The people seem to me deeply conscious and …, and self aware also. As all the Gazawi people I’ve met, they want freedom, progress and to look behind the wall. And as for the women who suffered under the Hamas restriction, I found them to be brave, open-minded and decent. 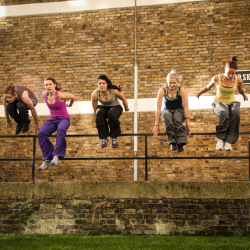 I think we can create a path for female parkour, where it can become a vehicle for freedom and reclamation. By Gato – www.parkourwave.com info@parkourwave.com This exchange was made possible through the support of UISP Peacegames and the following Social Centres: ZAM, Lambretta, Pacì Paciana. The Italian athletes involved were: Federico Gato Mazzoleni, Aloisi Elisabetta, Michele Gobbo (Parkourwave), Fabio Flow Saraceni (ADD Roma) and Davide Sebastiani (MoMu). Special thanks to Tara Robinson & Katie Sandford for bringing this together for See&Do.